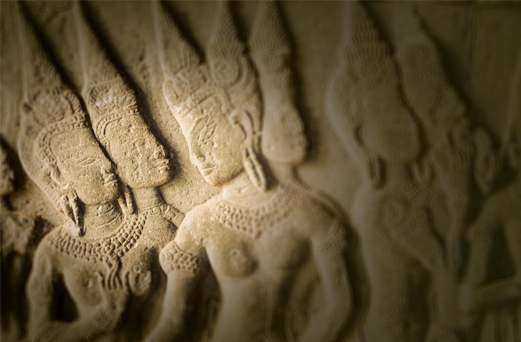 The language of Cambodia, Khmer, belongs to the Mon-Khmer family of languages. Khmer uses a phonetic alphabet with 33 consonants, 23 vowels, and 12 independent vowels. Visually, the Khmer alphabet is similar to the Thai and Lao, and many words in these three languages trace their origins to common Pali or Sanskrit roots. One significant difference is that Khmer is not tonal. In tonal languages, such as Thai, Lao, and Vietnamese, the same sound has one meaning when spoken in a high tone, and a different meaning when spoken in a low tone. Modern written Khmer can take two forms; an “oblique script” used for handwriting and most printed texts, and a “round script,” used for headings, titles, some religious texts, and other instances where certain words or phrases need to be emphasized. Khmer writing begins on the top left of the page, and proceeds down and to the right. Cambodian writing does not use spaces between individual words; instead, spaces are used to denote the end of phrases or sentences. the 23 vowels. The light gray boxes indicate the placement of the consonants. Khmer also includes 12 “independent vowels,” which can exist without a preceding or trailing consonant. The independent vowels may be used as monosyllabic words, or as the initial syllables in longer words. Khmer words never begin with regular vowels; they can, however, begin with independent vowels. Khmer numerals are also different, although Arabic numerals are being used with increasing frequency. There are also unique markings for Khmer punctuation, but modern Cambodian writing also incorporates several punctuation marks derived from Western typography. A good introduction to the basics of the Khmer language is available on the Cambodia Language and Culture page, at the Northern Illinois University Center for Southeast Asian Studies website. An excellent resource for learning Khmer is available from the FSI Language Course Site. The FSI courses were created by the U.S. government for diplomats and other individuals in the Foreign Service. The materials are in the public domain, and volunteers are scanning the written materials and digitizing the accompanying audiotapes.